My name is Anna Rose and I am 9 years old. Ever since I was little I've wanted to help endangered animals so that they don't become extinct. There are so many ways each person can help. Some of the ways that I choose to help are to volunteer at animal care groups like the MSPCA, feed birds in my backyard, count ladybugs for the Lost Ladybug Project, and raise money for organizations dedicated to protecting wildlife. I also try to make less trash, and I pick up trash in my neighborhood. To see me in action, check out my photos page or FaceBook. I hope you will join me; together we can save so many animals and keep our planet beautiful! 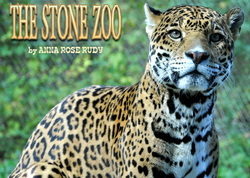 In April 2012, I wrote and published a book, The Stone Zoo, to raise money for my favorite zoo. All of the proceeds from the sale of the book go to the zoo. So far I've sold over 800 copies and raised more than $3,500 for the Stone Zoo. Gifts for Animals: In January 2013, for my 9th birthday, I asked friends and family to purchase gifts for the animals of Zoo New England instead of buying me presents. I also used my own money to buy some special items for my favorite animals at Stone Zoo. I collected 109 items worth $1,025.95 for the animals of ZNE!